I have been reluctant to open this thing to my readers. It seems to be genuine, but it also has a very dark side to it. One is forced to investigate some strange things, and since this was thrust upon me without my desire for it, I believe I must see it through. I have felt compelled to inform you all of my findings, and I am determined to learn if this is a hoax or something from the distant past that may have a special meaning for us all. How did this information get to me? During the 1990s I did a very extensive research into origins of religions in the Middle East. The result was 4000 pages of bibliography from over 300 secular writers who were epigraphologists and archaeologists on Middle Eastern origins. Little did I know that, while my research lead to a book on religions of the Middle East, in the 4000 pages of research were clues to other rather startling studies in Sumerian prophetic writings and historic events. So, I will give you the details up to this point in time, and when my source, an expert in Sumerian cuneiform writings, gets back to me, I hope to give you the last piece in the puzzle. 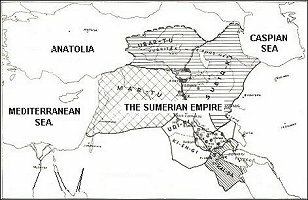 The Sumerian Empire was possibly the longest lasting in human history dating from 4100 BC to about 2000 BC. They were eventually contemporaries of the Assyrians and the Babylonians, though in those end years they fell behind the empires around them and faded. The final collapse of the Sumerian Empire was explained in cuneiform inscriptions as the result of not having enough gods. This was their own explanation, so it has remained a very strange explanation for many years. Empires usually collapse from within by corruption and social decay. How did the Sumerians survive for so many years though? The answer seems to be in their strategy for dealing with their neighbors and how they made war. The Sumerians were not exactly cowards, but they had invented a strategy to conquer their neighbors that usually did not require war. They would at first arrive at the scene of a showdown looking like they intended to start a massive battle. They would order their soldiers to come over a rise in the desert all at the same time. The army was strung out in one long line across the horizon, and they flashed polished brass shields reflecting the sun to blind the enemy. There was no second rank behind this line of soldiers, so the Sumerian army looked numberless, stretching from one horizon to the other. Remember, there was no air reconnaissance in those days, so this worked. The Sumerians may have invented the Armored Personnel Carrier also. 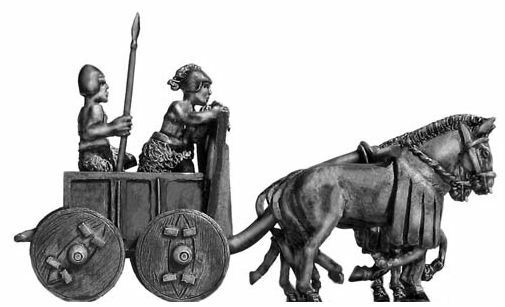 They had four wheel chariots that carried fifteen of twenty soldiers which would drive ahead of the mass of soldiers. So, the enemy almost always capitulated at once hoping for mercy, and they got it. The Sumerians would not kill anyone, but they demanded the god of the vanquished kingdom be handed over. After this, they let the people go home and pay a token tribute from then on. The Sumerians then took the god of the vanquished back to their capital, Nippor, and installed him in the temple in the highest place of honor for a year or so. This gave the conquered nation a great distinction, and while the nations did not actually line up to be conquered in order to see their god in charge for a year, they did capitulate very easily in many cases. Now, these aspects of Sumerian conquest and governance lead us to the end of my research, but I need to give you more information to get the whole context. Dr. Rafik Kouri, Director of Antiquities of the Institute of Antiquities in Upper Slobovia, in south Russia, had come to my attention from folio entries he had in the University of Michigan at Ann Arbor Library. He is a leading authority in Sumerian history and religious heritage. I found an address for him, and I wrote him asking what he knew about the Sumerian pattern of conquest-- what I have called "the Sumerian Anomaly." He wrote back after some time and explained that he was at the Bosra dig just north of the head of the Persian Gulf looking for the very things I had asked about. He said he had been seconded from the U. of M. to the Museum of Anthropology and Ethnography of the Peoples of the World in St. Petersburg, Russia. He was to supervise two digs, one at Basra, and one at Bahrain, which you may know is the present name of the ancient empire of Dilmun. The directors of the Russian museum are very eager to make connections between the god and myth heritage of Sumer, Dilmun, and the Indus Valley which we know as India. Dr. Kouri promised to keep my interest in mind as he worked the digs, and he mentioned that he too was very eager to get to the bottom of the question of the Sumerian god collection. It seems no archaeologist has ever found what we might call today a "Systematic Theology" for the Sumeian god pantheon. I recently received a report from Dr. Kouri which was amazing, and this report resulted in this article for my readers. Not only had Dr. Kouri remembered my interest in the Sumerian issues, he said that my suspicion that there was a missing key, a "Sumerian Anomaly" to the Sumerian pantheon was well founded. He had found exceptional results in both the digs at Bahrain and at Basra which opened up a whole new area of discovery in the Middle Eastern god system. The Sumerians had decided to adopt the god of Dilmun. This was estimated to have been done in about 3000 BC. This search for new gods was typical of the Sumerians. They were the first ecumenicals in world history, and their temples in Nippor were full of the largest god collection on earth. They believed they could add more and more spiritual power to their empire if they had all the world's gods in Nippor, the capital of Sumer. Sumer had not yet conquered Dilmun which is now known as Bahrain. Dilmun was a half way point on the road to the Indus Valley, now known as India. 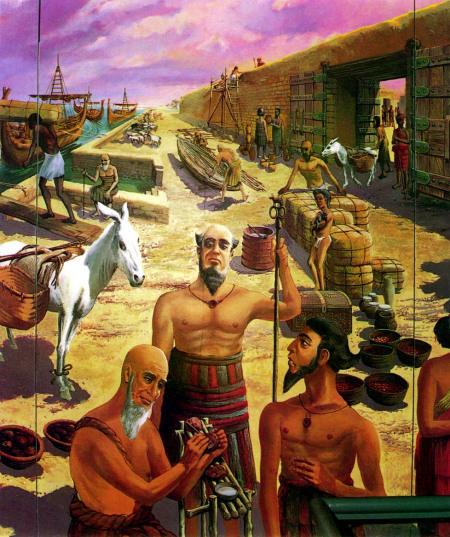 The Sumerians reasoned that the extremely wealthy Dilmunians might better manage their own trade rather than be conquered and tempted to lose heart. But Sumer wanted to have a say in Dilmunian policy. They decided to try to bring the Dilmunians under Sumerian influence by inviting them to contribute their god to the pantheon at Nippor. The Sumerians sent a delegation to Dilmun in what is now known as the Persian Gulf, and the Dilmunians were flattered that their god was highly sought, and, not wanting to be conquered for their god, they agreed to hand him over. Problem: The Dilmunian god was in a ziggurat in what is now the town of Basra, which back then was at the head of the Persian Gulf. Silting of the Euphrates has filled in the head of the Gulf, and Basra is now about 50 miles inland. The Dilmunians warned the Sumerian delegation of priests that the ziggurat had not been opened for over two hundred years, and the god was inside. No one had tried to open the ziggurat because of some perceived curse they believed would come upon the person who opened it. But, the Dilmunian priests told the Sumerian priests that they felt the threat of a curse was overblown, and they felt that the opportunity for the god of Dilmun to become the god in power back in the Sumerian capital Nippor would cause the god to suspend the curse, if there really was one. When the Sumerian and Dilmunian priests arrived at the ziggurat, the Sumerian priests approached the entrance, and they found a tablet embedded in a stone by the entrance. The entrance was made of perfectly fitting stone, and not even a crack was open enough to pry it open. One of the priests tried to read the tablet, but he could not decipher it due to dialect changes over hundreds of years since the day it was set in place. Also, the Dilmunian priests tried to read it, but all they could determine was that the god was said to be the high god of the Sturgeon Dynasty. This had been Kassite dynasty of kings in about 3700 BC who fashioned themselves as the sturgeon, a huge fish found in the waters of the area. Dr. Kouri is convinced this is where the fish hat comes from in so many pottery and bas relief samples from the Sumerian and Dilmunian era. This fish hat has come down to our day, it seems, in the Egyptian priest craft, and it is curious that the Pope of the Roman Catholic Church wears such a head piece. Since the priests of both nations could not decipher the inscription on the ziggurat, they determined that they need not worry about this, and they proceeded to open the ziggurat with much effort. Once an entrance stone was pulled away enough, the high priest of Sumer volunteered to enter and examine the inside and the god himself. As he approached the entrance something very strange happened. A wisp of smoke rose from the top of the ziggurat, and the priests speculated that the ziggurat had been built over a volcanic vent of some sort. The high priest of Sumer took several torches, and went inside. After a while, the high priest of Sumer came staggering out of the ziggurat, gasped, and fell dead. The whole project was abandoned by the Sumerians and Dilmunians under the assumption that the curse of the ziggurat was indeed still in force. This was the end of the story until our present day. Dr. Kouri tells me that the inscription on the cuneiform tablet at the entrance of the ziggurat was actually in the Kassite dialect. This was a mysterious tribe of Aryan people who came into Sumer from the north in about 3700 BC and ruled for about two hundred years at the head of the Persian Gulf. They were intruders in that they came into the Sumerian era midway, took charge and ruled with what sounds like Anglo-Saxon brutality, and then disappeared back to the north. No one has ever determined for sure who they were. They adopted the cuneiform script while they were in Sumer, but they used it phonetically to write the sounds of their own Kassite language. After the Kassites later disappeared to the north, this left the Sumerians hundreds of thousands of cuneiform tablets that could not be deciphered due to language differences. Thus, the tablet posted outside the ziggurat entrance. May the reader note the times. Here rests the god of the Sturgeon Dynasty. The year is 35,000 since the flood of Gilgamesh, and the Kassite kingdom is resting. The Kassite people leave to the north parts never to return. The world will continue for 2,011,880 days. At this time, a kingdom in the isles to the west, at the edge of the world, will end, and the world will be consumed by the sun with terrible heat. Dr. Kouri did some calculations from calendars of history, and he found that the days that would transpire, would end on December 21, 2014, and he wonders if the kingdom to the west that was said to end was the United States. This seems to be nothing but a coincidence and of no serious concern. The Sturgeon General has determined that smoking ziggurats are bad for your health. Well, now you know the end of the "Sumerian Anomaly." We must all so live that, at the end of the day, we will know that we have read all the signs and stayed clear of smoking ziggurats. You may quote me on that one if you give credits. I want to thank Dr. Rafik Kouri of the Institute of Antiquities in Upper Slobovia for his kind and thorough investigation of the Sumerian Anomaly. If you enjoyed this insane moment in my editorial career at your expense, keep checking back. I intend to have us all in a state of ubiquitous consternation, and other nasty circumstances, just as soon as I get more time to stretch the blanket. ANCIENT HISTORY THAT SHOULD CHARM THE BEAST IN YOU.